Registration for Yamaha Fundamental Skills Surveys and Grade Exams is now open and will continue throughout the month of February! By now, you should have received an email with FSS/ EXAM Registration Information and Preparation Materials! If you havent` please let us know! (excluding FSS) : Please print and bring those to EVERY class! 88Keys will be OPEN over Family Day weekend! 88Keys will be open and all classes will run as scheduled on February 16-17. The school will be closed on Monday February 18. Overall class participation and engagement. Overall progress week after week. To receive 10 points, your class must show excellent progress from week to week. Teachers will also be permitted to award up to 5 BONUS POINTS throughout the challenge for weeks where classes show EXCEPTIONAL progress. Classes that earn 100+ points before the end of the challenge will be treated to peanut and tree nut-free cupcakes at the end of the challenge! Individual students are also welcome to participate in The One Piano Player Challenge! Please ask your teacher about the modified challenge rules! We are excited to announce that our Annual Junior Original Concert is coming up, with a very special addition. As many of you know, the Junior Original Concert is an event where our Senior Students are provided with the opportunity to showcase their original composition pieces. 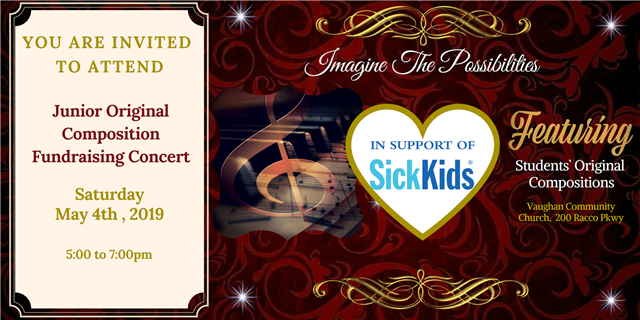 This year, it is with great pleasure that we dedicate our Junior Original Concert, and the amazing works of our students, to the Hospital for SickKids. Our goal is to raise funds and awareness for their new development plan, Project Horizon, in order to bring the best in class healthcare to kids in need. 1. Join our composers as they present their original compositions. Reserve your complementary tickets, and make a voluntary donation. 2. Unable to attend, but would like to support our Fundraising Event? 3. Help us to spread the word. Share the event with your family, friends, co-workers and social contacts. Follow us for all of the latest news, updates, and more! You are receiving this email because of your relationship with 88 Keys. Please reconfirm your interest in receiving emails from us. If you do not wish to receive any more emails, you can unsubscribe here.